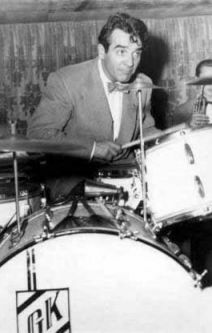 Gene Krupa began pursuing the drums while he was in grammar school and remained active on the instrument for the rest of life. This was contrary to his parent's wishes, who wanted him to enter the priesthood. He is widely considered have originated the format of the drum 'solo' -- an accomplishment, for those of us who have had to sit through far too many uninspired examples of this format, which inspires feelings a bit more complex than simple 'appreciation'. The influence of Gene Krupa upon the drumming profession can hardly be calculated. Through his work with countless other luminaries of the Big Band Era -- Benny Goodman, Tommy Dorsey, and Glenn Miller to name just a few -- he helped to raise the instrument from its role as a simple time-keeping device into far greater prominence. In 1938 he formed his own band, which, despite an arrest for marijuana in 1943 (for which he was later cleared), continued in various forms until 1951. Throughout the 50s and 60s Krupa worked with smaller groups, participated in the Jazz at the Philharmonic events, and co-founded a drum school. 1959 saw the release of The Gene Krupa story, a film only broadly based on his life in which he was portrayed by Sal Mineo and for which he himself provided the soundtrack. Diminishing health and a heart-attack in 1960 led to greatly diminished activity for Krupa, and in 1967 he announced he was retiring. Occasional returns to performance and a reunion with Benny Goodman followed until his death in 1973.